JUST HOW DO YOU DEFINE ELLA FITZGERALD with her gorgeous, rich and deeply resonating voice that lifts any song out of the norm? Making singing sound so effortless, Ella is singing the wonderful classic songs of Irving Berlin  how about that? Things can only get better. Ella Fitzgerald's Songbook series of albums is rightly famed as being among the greatest vocal jazz ever and The Irving Berlin Songbook is one of the best. Featured in its entirety, along with bonus tracks, this joins the Cole Porter and Rodgers & Hart Ella Fitzgerald releases on CD. 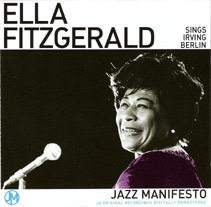 Containing all the songs featured on one of the best-selling jazz albums of all time  Ella Fitzgerald Sings The Irving Berlin Songbook  this CD features 31 original tracks plus seven bonus tracks that were released around the same period and all the original recordings have been digitally remastered. The classic 1958 album by the American jazz singer  with a studio orchestra conducted and arranged by Paul Weston  focuses on the songs of Irving Berlin and won a Grammy Award in 1959 for Best Vocal Performance, Female. All-time popular songs such as the wonderfully dynamic opener, Let's Face The Music And Dance, the remarkable favourite Puttin' On The Ritz, the meaty and generous Let Yourself Go and the upbeat Alexander's Ragtime Band provide Ella with an opportunity to dance her vocals around each track with evident enjoyment. Taking each note and making it crystal clear, Ella drops the tempo with the poignant How About Me? where she is totally in control as her long, drawn-out vocals tug at the heartstrings. Russian Lullaby is haunting and is given the full Ella treatment. Ella Fitzgerald sings Irving Berlin at her absolute best; sailing through track after dazzling track in her own inimitable style, splendidly and confidently creating patterns of musical harmony. She slips easily between tracks  including the popular Cheek To Cheek, I Used To Be Colour Blind or How Deep Is The Ocean  and on the bonus tracks she is joined by the equally-esteemed Louis Armstrong, whose deep, gravelly vocals give the songs a new dimension. Memorable numbers also include: You Keep Coming Back Like A Song, Reaching For The Moon and the fun, easy-listening Slumming On Park Avenue. One of our favourites, Pack Up Your Sins And Go To The Devil, is a marvellous track. Backed by the Chick Webb Orchestra, it is both vocally and musically perfect. And who could forget Isn't This A Lovely Day, I'm Putting All My Eggs In One Basket, All By Myself or I've Got My Love To Keep Me Warm? This is rich, glorious and trademark Ella.  Ella Fitzgerald Sings Irving Berlin is out now on the Jazz Manifesto Label in two-disc CD format, coinciding this year (2009) with the 30th anniversary of the death of Irving Berlin. Catalogue No: 38292 | RRP: �5.99. Bonus tracks  17 Isn't This A Lovely Day (Ella Fitzgerald & Louis Armstrong; from Ella And Louis) | 18 I'm Putting All My Eggs In One Basket (Ella Fitzgerald & Louis Armstrong; from Ella And Louis) | 19 I've Got My Love To Keep Me Warm (Ella Fitzgerald & Louis Armstrong; from Ella And Louis). Bonus tracks  16 I Never Had A Chance (from Like Someone In Love, 1958) | 17 Cheek To Cheek (Ella Fitzgerald & Louis Armstrong; from Ella And Louis) | 18 Pack Up Your Sins And Go To The Devil (with Chick Webb Orchestra, 1938) | 19 Everybody Step (with Chick Webb Orchestra, 1938).  Ella Fitzgerald: The Best Of Rodgers & Hart (26571) and Ella Fitzgerald Sings Cole Porter (26542) are both also available in the Delta range.